The placenta and extraplacental membranes are an apposition of fetal and maternal tissues for the purposes of physiological exchange. The placenta has a finite life span and is the body's largest biopsy, and yet its examination is often neglected, even in cases of fetal and neonatal deaths, sick and premature neonates, and maternal complications of pregnancy. Several monographs and reviews on the placenta have provided a better understanding of its examination and pathology (Benirschke and Kaufmann 2000; Vogler et al. 2000; Khong 2001; Hargitai et al. 2004; Kraus et al. 2004; Faye-Peterson et al. 2005). 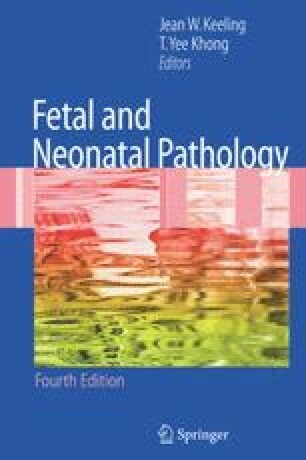 The introduction of noninvasive techniques to investigate the fetal well-being early in pregnancy, including antenatal diagnosis, has made it important for the pathologist to become familiar with the development and structure of the placenta through all stages of pregnancy. Significant pathological processes can affect the placenta before involving the fetus. Many placental and implantation site lesions can now be visualized by ultrasound, in utero magnetic resonance imaging, or Doppler ultrasound assessment of fetal, umbilical, and maternal vessels. Correlation of these findings with placental histopathology is important for quality assurance purposes. In recent times, examination of the placenta has come to assume an important role in obstetric litigation, commonly when there is perinatal death, fetal distress, or alleged cerebral hypoxia (Kraus 2003).